Daughter of Godfrey Venerini, physician in Viterbo, Italy. Following the death of her fiance, she entered a convent; following the death of her father, she returned home to care for her mother. She invited neighbourhood women to pray the rosary in her home, and formed a sort of sodality. As these friends had little religious education, she began to teach them. Jesuit Father Ignatius Martinelli, her spiritual director, convinced her that she was called to be a teacher instead of a contemplative nun. With two friends, Rose opened a free pre-school for girls in 1685, which was well received. In 1692, Cardinal Barbarigo asked her to oversee training of teachers and the administration of schools in his diocese of Montefiascone, Italy. She organized schools in many parts of Italy, including Rome, and by the time of her death there were 40 schools under her direction. Friend and co-worker with Saint Lucia Filippini. Rose often met opposition, some fierce, and some actually violent - her teachers were shot at with bows, and their houses burned. She was never deterred, teaching, and finding people who were willing to face the danger in order to do good. The sodality, or group of women she had invited to prayer, were ultimately given the rank of a religious congregation. Today, the so-called Venerini Sisters work with Italian immigrants in the United States and elsewhere. Born to a poor farming family, Agostino spent his youth as a mountain shepherd, using his solitary time for prayer. During a parish mission in May 1835, he realized a call to the priesthood, a calling he attacked with prayer which led to financial aid that allowed him to study at Genoa, Italy. Ordained on 19 September 1846. Priest at Saint Martin d'Albaro in 1846, then the Church of Consolation in Genoa in 1854. Chaplain of the provincial orphanage in 1874, a post he held for 22 years. Prison chaplain, working especially with prisoners condemned to death. He established a residential school to train young women who were in danger of starvation or falling into prostitution because they had no support. On 15 October 1876, he founded the Institute of Sisters of the Immaculata to run this and other residential centers he established. Born to a modest but pious farm family. Married layman. Farmer in Villa d'Ogna, Italy. 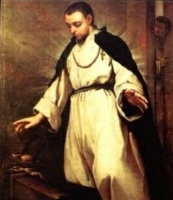 Dominican tertiary. Known for his ministry and devotion to the poor. Pilgrim to Rome, Italy, to Jerusalem and to Compostela, Spain. Settled finally in Cremona, Italy. Known as a miracle worker. Studied at Canterbury under Saint Adrian and Saint Theodore. Benedictine monk at Whitby. Bishop of Hexham, England in 687. Metropolitan of York, England in 705. Founded a monastery at Inderawood (later Beverley), which became an important ecclesiastical center. Ordained the Venerable Bede who wrote of him, and recorded miracles worked by him. John always preferred the contemplative life and retired to the Inderawood Abbey in 717. King Henry V's victory at Agincourt was attributed to the aid of Saint John and Saint John of Bridlington. Priest. Bishop of Tongres (in modern Belgium). He spoke out convincingly against heretics and pagans. Opposed heretics at the Synod of Orleans in 549. Encouraged the development of writings and sermons against heresy. Worked in the Meuse Valley to convert pagans. Built churches and hospices to care for the spiritual and physical needs of the people. Well known for his generosity, his fund-raising abilities that helped ease a famine, and his work against heretics. Member of the Franciscan Conventuals, taking the name Antonin. Priest. Worked with Saint Maximilian Kolbe. Imprisoned, tortured and executed by the Nazis for the crime of being a Catholic priest. Martyr. Bishop of Voghenza, Italy, the modern titutal diocese of Vicohabentia; may have been the last bishop of that diocese before the area was joined to the diocese of Ferrara, Italy. That’s what we’re relatively sure about. The legend writers, though, they invented all kinds of things - he was the king of Mesopotamia who abdicated to become a wandering priest, that he met the pope who saw his obvious holiness and consecrated him a bishop, that his first Mass as bishop was accompanied with choirs of angels, etc. Roman noble lay woman. Grand-daughter of Emperor Vespasian; niece of Emperors Titus and Domitian. Married to Titus Flavius Clemens, a Roman consul, nephew of Emperor Vespasian, and first cousin of Emperors Titus and Domitian; foster sister of Saint Ephyrosyna of Terracina and Saint Theodora of Terracina. Convert to Christianity. Widowed when her husband was martyred in 96. Banished to the island of Pandataria in the Tyrrhenian Sea. Possibly martyred, though records are sketchy. Third century bishop of Salona, Dalmatia (in modern Croatia). Martyred with seven other Christians in the persecutions of Diocletian. Priest. Member of the Society of the Priests of Saint Joseph Benedict Cottolengo. Noted preacher and deeply involved in the work of the Little House of Divine Providence which provides a broad range of medical and social services to the poor. Sister of Saint Henry II, emperor of Germany. Wife of Saint Stephen of Hungary. First Queen of Hungary. Widow. After a life of using her position for charity, she retired to the convent at Passau in modern Germany. Commemorates the appearance on 7 May 351, Pentecost that year, of a luminous image of the Holy Cross in Jerusalem. It stretched from Mount Golgotha to the Mount of Olives (about two miles / three kilometers), was brighter than the sun, lasted several hours, and was seen by the entire city. It led to many conversions, and was reported in a letter attribued to Saint Cyril of Jerusalem. 7th century deacon in the area of Le Mans, France. Hermit at Séez, France. Benedictine monk who attracted 140 brother monks by his piety and wisdom. Sixth-century monk who worked with Saint John Zedazneli to evangelize Georgia. Imprisoned for several years and then martyred for his faith in the persecutions of Valerian. Mercedarian who ransomed 530 Christian slaves from Moorish occupied Spain in 1428. Born to the Italian nobility. Monk. Hermit near the River Sarthe in France. Abbot of a local monastery. Benedictine monk at the monastery of Fonte-Avellana, Italy. Priest. Bishop of Gubbio, Italy in 1206. Benedictine monk. Abbot in the basilica of Saint Symphorian at Autun, France. Brother of Saint Augustine of Nicomedia and Saint Augustus of Nicomedia. Bishop of Nicomedia. Martyred in the persecutions of Diocletian. Brother of Saint Flavius of Nicomedia and Saint Augustus of Nicomedia. Martyred in the persecutions of Diocletian. Tortured and martyred in the persecutions of Decius. Brother of Saint Flavius of Nicomedia and Saint Augustine of Nicomedia. Martyred in the persecutions of Diocletian. Born to the Italian nobility. Monk. Hermit near the River Sarthe in France. One of a large group martyred in Africa.